Feeling great about the way you look is essential to your confidence, self-esteem and your entire well-being. And, sometimes, getting the look you desire it too difficult or downright impossible without some help. Our plastic surgeon, Dr. David Bogue, is committed to helping members of the Boca Raton and Ft. Lauderdale communities love how they look through plastic surgery. Our procedures are safe, effective, and will help you achieve your aesthetic goals. To schedule a consultation with Dr. Bogue in Boca Raton, FL, please call 561-886-1002. Breast implants – our plastic surgeon can add volume to your breasts using an implant that will work best for you. You can achieve larger, fuller breasts that will give you the confidence you desire. Breast lift – in this procedure, Dr. Bogue will remove excess skin from your breasts to give them a perky, lifted, and beautiful look. Breast reduction – sometimes, breasts can be too large for your frame. When this happens, it can cause a myriad of problems including back, neck, and shoulder pain. In a breast reduction, our plastic surgeon will remove volume from your breasts so they are a comfortable and pleasant size. Oftentimes, health insurance will cover this procedure or at least a portion of it because it helps prevent further treatment of an injured neck, back, or shoulders. Breast reconstruction – after undergoing a mastectomy because of breast cancer, many women opt for a breast reconstruction so they can feel feminine and whole again. Dr. Bogue can reconstruct your breasts using your own tissue or through the use of breast implants. Liposuction -- in this procedure, Dr. Bogue can expertly remove excess fat cells from nearly anywhere on your body. This is ideal for those that have tried to lose weight on their own and lead healthy lives, but have stubborn pockets of fat that they can’t seem to get rid of through diet and exercise. Tummy tuck – a tummy tuck can be performed on the lower portion of the abdomen or on the entire abdomen. The procedure is designed to eliminate sagging and excess skin and stretch marks from the abdominal area. During the procedure, our plastic surgeon will also place sutures in your abdominal muscles to help tighten them. Mommy makeover – a mommy makeover is designed for women that want to rejuvenate their post-pregnancy body in multiple ways. A mommy makeover can be combination of procedures to restore your breasts, abdomen, thighs, vaginal area, and more. Dr. Bogue will create a plan to ensure that you have the least amount of procedures as possible and to consolidate recovery time. Facelift – in a facelift procedure, our plastic surgeon will remove excess or sagging skin, tighten the remaining skin, and leave your face looking naturally healthy, young, and revitalized. Neck lift – in a neck lift, our plastic surgeon can remove unsightly sagging skin, a double chin, and neck banding that might make you look older than you are in actuality. Eyelid surgery (blepharoplasty) – this procedure helps restore your young appearance by removing puffy and bulging eyelid skin, bags from under your eyes, and hanging eyelid skin. Why Choose Our Plastic Surgeon? When selecting a plastic surgeon, there are a few vital pieces of information that you must consider. 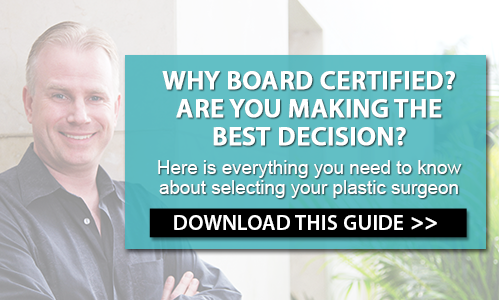 Primarily, you must ensure that your plastic surgeon is Board Certified. Dr. Bogue is Board Certified by the American Board of Plastic Surgery which means that he has undergone extensive training and practice to become a plastic surgeon; he is not simply a doctor that is opting to perform plastic surgery procedures. Additionally, Dr. Bogue is the Chief of the Department of Surgery at Boca Raton Regional Hospital and has had endless accolades and honors placing him at the forefront of his field. Dr. Bogue also makes your comfort his priority. He combines his decades of experience with a bedside manner that shows he truly cares to ensure your experience is the best it can be. Dr. Bogue provides state-of-the-art care using advanced technology and techniques. He has hospital privileges at Boca Raton Regional Hospital and ensures your safety, comfort and quality of care every step of the way. "Dear Dr. Bogue, Claudia and Jackie: Thank you so much for taking such great care of me. Dr. Bogue, you are an artist in what you have done for me. Thank you for going into this field and helping women like me. Claudia and Jackie, thank you for always treating me with compassion and a smile. I appreciate it! – Sonia"
Cosmetic surgery should be individualized to your body and your goals. Dr. Bogue provides state-of-the-art care and outstanding results tailored to your personal concerns. Dr. Bogue does all this by taking the time to get to know you as a person, not simply a patient. Dr. Bogue provides all the time you need to discuss your wishes, consider your options and ask any and all questions you have on your mind. You will see Dr. Bogue and communicate with him throughout your care. He makes himself fully available to you from start to finish. If you live in or around Boca Raton, West Palm Beach, Fort Lauderdale or the surrounding areas, please call the practice of board-certified plastic surgeon Dr. David Bogue at 561-886-1002. We offer complimentary consultations.